Fall Outerbike 2017 in Moab, Utah was the perfect opportunity to escape the daily grind and demo the latest mountain bikes on some unique terrain. Outerbike certainly draws a crowd and unless you are in line long before opening, your bike options will be limited. Considering I was at the event to relax and ride bikes, I took my time getting to the event and was not at all surprised to find that I was going to really have to search for any remaining demo bikes! As I strolled the vendor tents looking for a demo bike, a unique product grabbed my attention. FASST Company, a company there to release some new handlebars to the market, had their new bars on display. Okay I know, mountain bike handlebars might not grab the attention of others in quite the same way they did for me and for some of you, you may even be tempted to stop reading here. I beg you, keep reading as I will reveal how a set of handlebars may in fact be the next big thing in mountain bike rider comfort and control. FASST Company has something different, perhaps ground breaking…enter the Flexx bars. Jason Parsons from FASST Company gave me the low down on the bars while I grabbed some photos and got setup for a test ride. They were mounted on a 2017 Transition Scout, which was perfect since I was able to get out on a 2018 Scout (sans Flexx bars) immediately after the Flexx bar demo. Yes, that’s right, there were still some awesome demos available despite my late arrival! 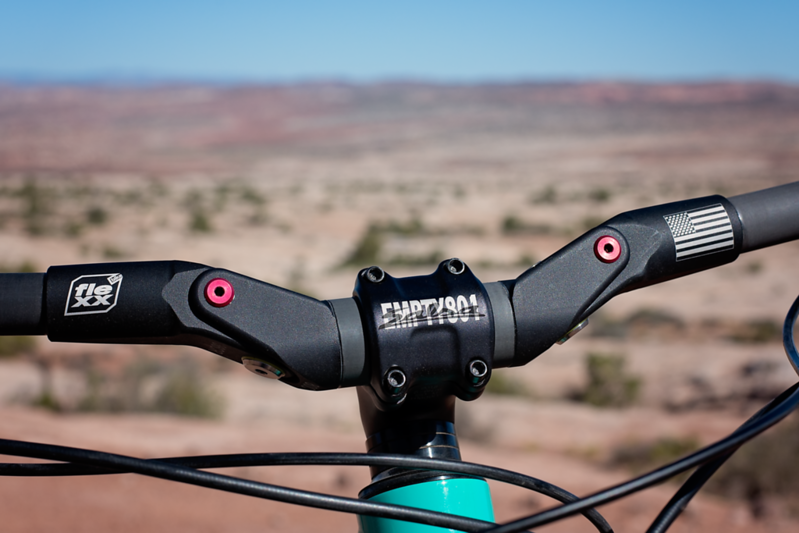 Although the Flexx mountain bike bar is a new product for FASST Company, and their first foray into MTB products from what I understand, they have been making high tech handlebars for years. As someone who also rides dirt bikes, I immediately recognized the FASST Company Moto flex bars, also on display. 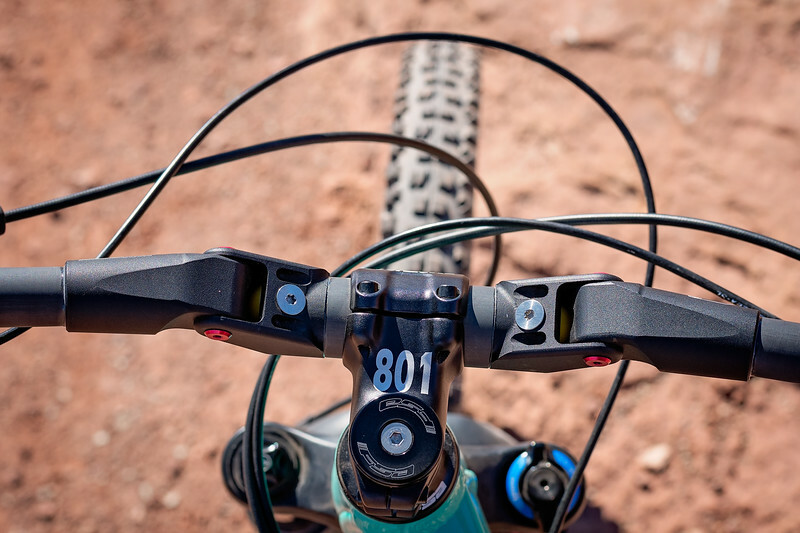 The new mountain bike bars work on the same premise as the Moto bars, but do so with lighter materials and some ingenious engineering and production methods to meet the demands of today’s mountain bikers. The Flexx bars use elastomers to absorb high frequency vibrations transmitted through the handlebars. The design allows for 5 degrees of movement. From what I understand this movement is almost entirely in the downward path, but a small amount of upward movement is also detectable. This is a result of a smaller elastomer that dampens the upward travel (rebound) and prevents metal on metal contact. Just playing around with the bars prior to my demo, I thought the upward movement was going to be distracting or maybe even annoying. However, I didn't actually notice the upward movement at all while riding the bike. In fact, the handlebar felt pretty natural and I was never acutely aware of the extra movement taking place during my ride. Before I get into my thoughts on this product, I want to touch on some of my bike setup preferences and reasons this product is so intriguing to me. I like riding with thin grips as I find them easier to control the bike. I have a similar preference for gloves without padding inserts in the palm. While this type of setup is great for bike control, it certainly contributes to hand numbness and the upper body fatigue I sometimes experience on rides. My first ride on the Flexx bars was on one of the designated Outerbike test loop trails with a lot of sandstone featuring plenty of sharp edges and rough sections. I was able to quickly forget about the bars and just focus on riding. Although I was aware of less vibration felt at the bars, I couldn't really differentiate if the increased comfort was coming from the bars or suspension fork at this point. The bars were certainly not distracting, but I hadn't experienced the revelation I hoped they would be, at least not yet anyway. So what did I think after one ride? To be honest I wasn't really sure at that point. After returning the bike to FASST Company I was able to go out on the new 2018 Scout from Transition Bikes. Although I preferred the geometry and fit of the new Scout, I quickly noticed something that was missing. The absence of the FASST Company Flexx bars was now readily apparent as high frequency bumps and hard impacts were felt in much the way I am used to. I mean, there I was on a bike with a little more travel in the fork, but a noticeably rougher ride without the Flexx bars. I would say the experience is akin to going from an 80mm travel xc bike to a fully rigid bike. It’s a pretty big difference and the fact that the Flexx bars work in the same plane as your suspension, FASST Company's explanation, you don't really notice them doing their job. This is a great attribute of the bars. The bars don't change the way your bike feels so much as the way you feel during and after a ride. After riding many more bikes throughout the day, I returned to the FASST Company tent for another demo. I had to see if my experience was legitimate or all in my head. This time I went out on a 2017 Transition Patrol alloy. For this test I was deliberately taking the rough line options and looking for trail chatter. Without a doubt the shock and vibration coming through my hands was greatly reduced with the Flexx bars. As someone who often has to shake the numbness from my hands, this seems like a product I would benefit from. I can also see the bars contributing to more confidence when charging rough sections on the trail. Furthermore, anyone with hand, wrist, or arm injuries may really appreciate the increased shock absorption these bars offer. After getting another ride on the bars, I think they feel great and address rider comfort in a unique way. FASST Company representatives at the event seemed to indicate the retail price was not set yet, but the moto bars retail for $359.99 and the MTB bars are apparently more expensive to produce. If potential buyers are given the opportunity to trail test the bars, I think many riders will be sold on the Flexx bars. However, a potential drawback may be the price point. Some riders will mistakenly look at them simply as high end handlebars. 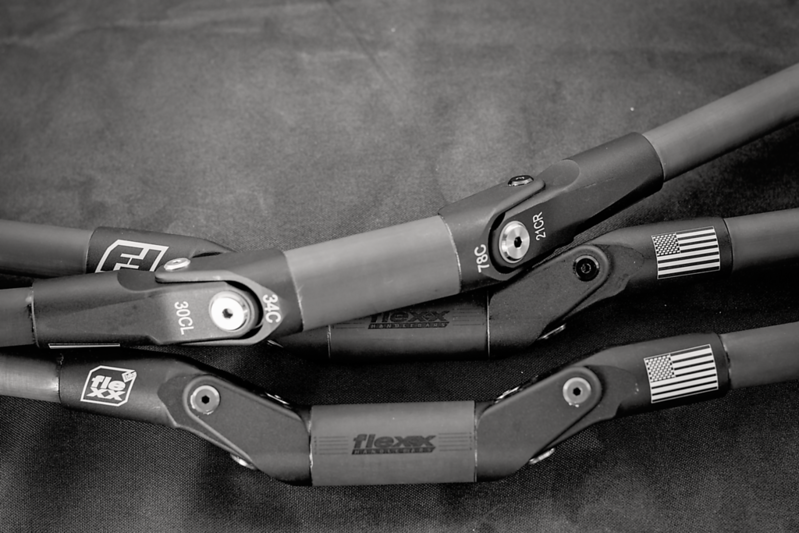 The reality is the Flexx bars offer high frequency shock absorption that compliments your suspension allowing you to ride faster and longer with less fatigue. In short the Flex bars are a suspension component that addresses the vibration our suspension forks can't. At 430g the bars are impressively light considering what they do and the 800mm standard width. The fact that they replace a part that commonly cost 1/3 of the price may be a hard pill to swallow for some, but after spending about an hour and half total on the bars I’m sold for my next bike build.